The automotive industry has consistently provided a wide array of opportunities for the automated optical metrology players. The current boom in auto sales, especially in emerging regions, is therefore a key factor driving the demand for automated optical metrology. The same applies to the aerospace sector, where increasing air traffic and the need for advanced automation processes is creating an accelerated demand for automated optical metrology. Industries have to adhere to the various quality standards set by each region. The growing rate of standardization for quality control on an international level is therefore allowing players from the automated optical metrology market provide invaluable services for the same. The standards for automated optical metrology services themselves, however, are lacking a sturdy universal measurement foundation. This could continue to hamper the growth of automated optical metrology players until a standard is maintained. It is owing to these factors that the global automated optical metrology market is expected to expand at a CAGR of 7.6% from 2015 to 2021. This market is expected to accrue a revenue of US$1.565 bn by the end of 2021. Emerging economies such as those from the Asia Pacific region are showing a high demand for reducing the level of human handling. This is calling on the automated optical metrology players for implementing advanced automated systems that can function with the least amount of human intervention, thus providing massive opportunities for the manufacturers of these systems. China, Japan, and India are the three key countries in the Asia Pacific to demand automated optical metrology equipment. Their high demand is caused due to the rapid rate of industrial evolution and the growth of industrial infrastructure. Meanwhile, Europe continues to lead the demand for automated optical metrology systems due to a high need for swathing over to international measurement compliances. The region is showing an especially high demand for automated optical metrology for the accurate measurement of non-contact surfaces, along with a growing auto industry. Automotive, consumer electronics, medical, industrial, and aerospace and defense are the major application sectors for automated optical metrology. It can be assumed that any changes in the market behavior of these sectors will directly reflect on the overall demand for automated optical metrology. This applies more to the automotive and aerospace industries, where the growth of users and travelers is creating a high demand for advanced transport methods. Both sectors – especially the automotive sector – are witnessing a growth in users. The current high demand for vehicles with improved features is spurring the use of automated optical metrology in modern cars. By the end of 2021, the automotive sector is expected to take up 26.9% of the overall revenue generated in the automated optical metrology market. The top players in the automated optical metrology market currently include KLA Tencor Corporation, ASML Holding NV, Hexagon Metrology, Inc., Nikon Metrology NV, and Steinbichler Optotechnik GmbH. This market research study analyzes the automated optical metrology market on global basis and provides estimates in terms of revenue (USD Million) from 2014 to 2021. It describes the market dynamics affecting the industry and analyzes their impact through the forecast period. Moreover, it highlights the significant opportunities for market growth in the next six years. Optical metrology helps calibrate objects that cannot be measured physically. It is the science and technology of measuring unknown qualities with light. The measurement principle of optical metrology is based on the fact that the transmission of light is without any contact. Therefore, optical metrology is generally used in areas where physical contact cannot be made between the measuring equipment and the object to be measured. Different light sources such as narrowband, broadband and laser can also be used on measuring equipments to calibrate the measurements and retrieve the data on a receiving target. The receiving target analyzes the data with the help of software algorithms and provides an accurate result to the user. Laser scanners, coordinate measuring machines and video measuring machines are the major optical metrology products that provide precise measurement information. The growing need for compliance to international industry standards and accurate measurement data has led to the application of optical metrology products in various business sectors such as automotive, industrial and aerospace. Optical metrology products find the largest application in the automotive sector. The automotive sector is witnessing huge growth due to the increasing usage and production of vehicles globally. Advanced optical metrology equipments that provide accurate measurement results are largely demanded by the automotive sector, where there is a requirement of measuring objects having unknown quantities. Therefore, the growth in the automotive sector is set to drive the market of automated optical metrology market across the world. Aerospace sector is one of the booming sectors, where optical metrology finds various applications. In the civil aerospace market, civil passenger aircrafts are expected to double by the year 2030. Increasing air traffic and replacement of aging aircrafts with new and advanced aircrafts are set to drive the growth of civil aerospace market; furthermore driving the growth of global automated optical metrology market. In addition, the aviation industry rely on high quality measurement standards and computer aided design (CAD), which makes the use of optical metrology equipments very significant in the aerospace sector. Although there are a number of organizations that set quality control and measurement standards across the globe yet the measurement standards are contradictory to each organization. This creates dispute in measurement policies of companies in various countries. Therefore, the lack of universal measurement is expected to inhibit the global automated optical metrology market till the time a universal measurement policy is established. The market is segmented on the basis of geography into Europe, North America, Asia Pacific and Rest of the World (RoW). These segments have been estimated in terms of revenue (USD million). In addition, the report has been segmented based on product types, which includes, video measuring machines, laser scanners and coordinate measuring machines. In addition, the report is also segmented by application that includes automotive, consumer electronics, industrial, medical, and aerospace and defense. 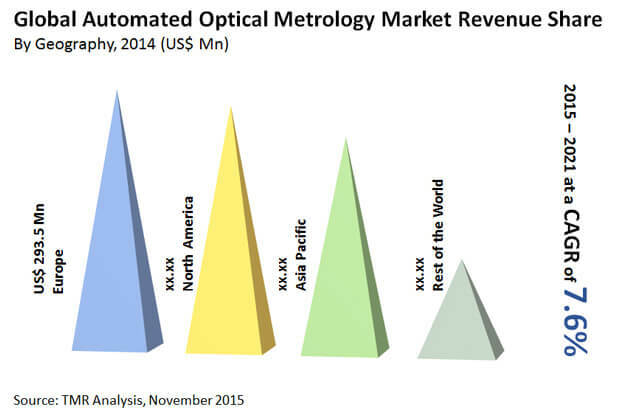 For better understanding of the automated optical metrology market, the study comprises market attractiveness analysis, where the product types are benchmarked based on their market scope, growth rate and market attractiveness. The report also provides company market share analysis of the various industry participants. Key players have been profiled and their company overview, financial overview, business strategies and recent developments have been covered in the report. Major market participants profiled in this report include: KLA Tencor Corporation (U.S.), ASML Holding NV (Netherlands), Hexagon Metrology, Inc. (Sweden), Nikon Metrology NV (Belgium) and Steinbichler Optotechnik GmbH (Germany) among others. The report provides a cross-sectional analysis of by product type and of by application segment with respect to the above mentioned regions.